DETROIT — Toyota is almost considered shorthand for quality cars. Ford once told us in its ads that “Quality is Job 1.” Whether you believed the statement or not, the message was clear. Words like “stylish,” “performance,” even “capable” are more likely to come to mind. Quality might not always be easy to nail down even though many car buyers use the term as a stand-in for “reliable” or “dependable,” but it’s an attribute that some companies seem better able to claim than others. Fiat Chrysler has struggled in this department, which the company acknowledges. Each year, when J.D. Power and Consumer Reports release their annual surveys and rankings, most FCA brands fall at or near the bottom, and this year has been no different. The automaker has also been hit by a rash of recalls. In just the past year, recalls — not counting those for air bags, an area where scores of automakers continue to deal with fallout from defective Takata products — were announced for more than 8.3 million FCA vehicles in the United States. Those recalls covered everything from steering components to floor mats. Consumers can choose to view recalls using different lenses. Either a company is proactively working to address its problems or it’s an area of concern about what a company is putting out on the road. How a carmaker responds to problems can eventually influence how consumers view that company. Hyundai, for instance, ranks highly on third-party measures related to quality, but recently it has been blasted by safety advocates for what has been seen as a slow response to engine fire risks in some Hyundai and Kia vehicles. Mark Champine knows FCA is not where it needs to be in terms of quality, but he says the company is moving in the right direction. As FCA’s head of Quality for North America since October, Champine says he can influence that effort, but he acknowledges the challenge. “No, we’re not moving fast enough. We need to move faster to get to … our objective, which is to be among the best. 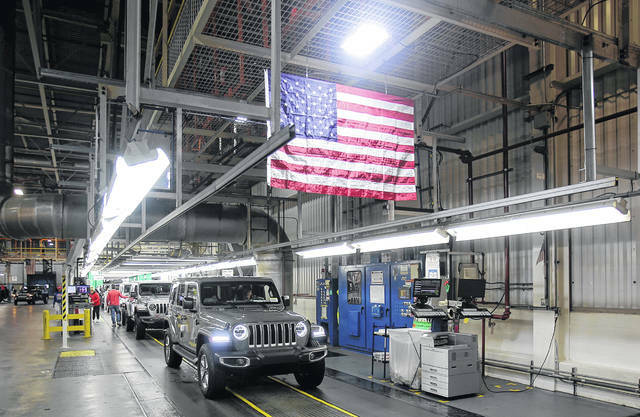 That’s our mission,” Champine told the Free Press during a meeting at the company’s U.S. headquarters in Auburn Hills, north of Detroit, earlier this month. Reaching that goal means emphasizing a message that quality is important, and, as an example, Champine presented a small, glossy pamphlet that is now distributed at company events. On the cover is the word “Quality,” with the letter Q created by the image of a globe and a check mark, and the phrase, “Do Whatever It Takes.” Inside are images, including a roaring lion and what appears to be a footprint left on the moon, and themes to promote the quality ideal. “Quality represents the starting point and is woven into the fabric of everything we make and do. … There is no finish line,” according to one passage. Champine, who grew up in St. Clair Shores, Mich., is a 23-year company veteran with an engineering background who previously served as head of Electrified Powertrain Programs in North America. “I have tremendous respect for the position I have. It is a very difficult seat. It is a seat that can have a big impact on the quality of our vehicles,” said Champine, who oversees quality for one of the automaker’s four regions. He reports to Richard Schwarzwald, who was named to the top global quality post in October and sits on the company’s Group Executive Council, a key decision-making body. The impact of a negative Consumer Reports survey spelled the end of one former FCA quality chief’s tenure when Doug Betts left in 2014. Betts has since taken a key role at J.D. Power. In brand rankings released by Consumer Reports in February, all but one of the FCA brands listed were near the bottom, with Fiat coming up dead last (Cadillac, GMC, Mitsubishi, Land Rover and Jaguar were also in this group). The publication noted that Chrysler, which ranked highest among FCA brands, had actually tied Tesla for the brands that had dropped the most from the previous year. Two FCA models out of six total — the Chrysler 300 and Dodge Charger — even lost their recommendations from Consumer Reports this year. The other models no longer being recommended are the Tesla Model 3, Acura RDX, BMW 5 Series and Volkswagen Tiguan. J.D. Power’s 2019 U.S. Vehicle Dependability Study, which reviews 3-year-old models, listed no FCA brands above the industry average, although it did note that Chrysler was the most improved brand and two models — the Dodge Challenger and Chrysler Town & Country — led their segments. FCA’s crosstown Detroit rivals Ford and General Motors are certainly not immune from problems. Ford and Lincoln were both below the industry average in the J.D. Power dependability study. GM dominated Consumer Reports’ 2019 list of least reliable vehicles with five entries — the Cadillac CTS, CT6 and Escalade and Chevrolet Silverado 2500 HD and Buick Enclave, compared with no vehicles for Ford and only one FCA product, the Alfa Romeo Giulia. Jake Fisher, senior director of auto testing for Consumer Reports, said quality has been a long-standing issue for FCA. “For several years now, we’re seeing the quality of those vehicles … has not been very good. There’s been some bright spots from Ford, bright spots from GM. We haven’t seen that from FCA,” Fisher said. He attributed some of the potential differences with other automakers to the company’s focus. “A company like Chrysler, their focus is about maybe newer technology and exciting styling and vehicles that might excite you,” he said, noting that the company was an early adopter of the 9-speed automatic transmission, technology that was initially problematic, even leading to a lawsuit over rough shifting. While there might be good reason to try new things, Fisher noted that other automakers appear to be more hesitant to “push the envelope” for fear of damaging their reputation. Champine said the introduction of the 9-speed transmission developed from a need to update the transmission portfolio when FCA was formed. The company worked with German supplier ZF following what he described as a successful partnership on the company’s 8-speed transmission. “That design (in the 9-speed) did not have the … product stability that the 8-speed had, and we had some learning to deal with the innovation that’s in that transmission that took time,” Champine said, noting that those issues have since been stabilized. Champine did note that FCA’s suppliers have suppliers, and the company has found issues at times in some of the components sent to the main suppliers. But those entities, he said, also supply other manufacturers. “It would be hard to think that we’re the only ones that are getting those issues,” Champine said. Vehicle owner satisfaction, of course, goes beyond just reliability. Tesla owners are “very satisfied” even though every model is below average in reliability, Consumer Reports’ Fisher said. At J.D. Power, Dave Sargent, vice president of global automotive, takes a more optimistic view of FCA’s prospects. “We have seen some pretty good improvement over the last few years,” Sargent said, describing the trend for FCA as strong. It’s an area that Champine sought to highlight when he met with the Free Press, showing a chart from J.D. Power’s 2018 Initial Quality Study, which measures problems with new vehicles in the first months of ownership. That survey showed FCA just behind Toyota in a chart ranking automakers by number of problems per 100 vehicles. While FCA (and, perhaps surprisingly, Toyota) were just below the industry average in this survey, FCA was ahead of companies such as Mazda, Volkswagen, Honda and even Subaru. On another chart, Champine pointed to the company’s improvements on the Initial Quality Study since 2015. That survey showed FCA at 132 problems per vehicle compared with the industry average of 112. By 2018, the numbers had gotten much closer, with FCA at 96, the industry average at 93 and the top group at 87. Sargent noted that although FCA has performed below average in surveys of quality and dependability, the company’s vehicles do well in other areas, such as appeal and performance and that, for the most part, people really like their products. He also echoed comments by Consumer Reports’ Fisher that consumers gravitate toward different vehicles for many reasons, and that reliability is only one measurement of satisfaction. “The absence of problems is not how most people want to live their lives,” he said. Julian Gatti, who lives in Detroit’s Midtown area but hails from Clinton Township, Mich., has his eye on FCA’s Alfa Romeo Giulia sedan and Stelvio SUV. The 20-year-old would love to see the Giulia in green and he can wax poetic about his preferred interior materials in the Italian sedan. Although Gatti drives a 2014 Chevrolet Malibu, a succession of close relatives has owned FCA products, and he sees some positives there, too, including a still-running 2004 Chrysler Sebring with almost 200,000 miles. Gatti’s view on quality is expansive. “I think the Italian mark of quality is found in design and performance, rather than reliability. My Italian heart beats to that pace. So if I bought an Alfa Romeo and wound up in the shop a few more times than expected, it would be an authentic experience,” Gatti said. Several industry experts noted that the lenses used to measure quality and dependability have changed over the years, and vehicles themselves have gotten better overall. John McElroy, who hosts “Autoline,” noted that J.D. Power has put more focus on issues of connectivity and user experience in recent years. “If you look at the reliability of cars, it’s pretty good today,” McElroy said, noting that Honda and Ford both suffered in the surveys at one point because of infotainment or radio-related issues. FCA “would not be having the sales success they have had for years right now if there were genuine problems with their cars,” McElroy said. McElroy offered a few suggestions for how a company such as FCA can improve quality-related metrics: providing a more even cadence of product introductions and having the head of quality report to the company’s chairman, rather than just the CEO. “Unless you put that level of importance on it and you clearly empower that executive, you’re probably not going to get big results,” McElroy said. Don Sherman, a Hagerty magazine contributor and longtime automotive freelance writer, noted that FCA tends to play to its strengths, an attitude reflected in its early decision to focus on SUVs and trucks over cars.